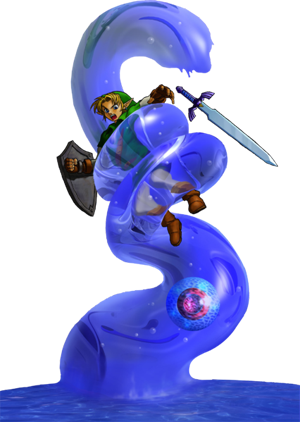 The Morpha is the Boss of the sixth dungeon in Zelda: Ocarina of Time, The Water Temple. It was created by Ganondorf and has complete control of the water in the room where Link must battle it. The battle against Morpha is quite easy if the player knows its big weakness, and traps it in a corner and uses the longshot. “Link is using the Longshot, the item from the Water Temple; the Zora tunic, which allows him to breath underwater and the Iron boots with which you can walk underwater. As allways I’ve tried to be as loyal as posible to the design of the original game from Nintendo 64 rather than using oficial ilustration as reference. I must say that, in my opinion, this and barinade are the worst bosses of ocarina of time, specially because after beating all the water temple, which was so frustrating due to the way you had to equip the iron boots, this boss was not rewarding enough.